Work is nearing completion on the North Creek Clearwater Reach stream restoration project. 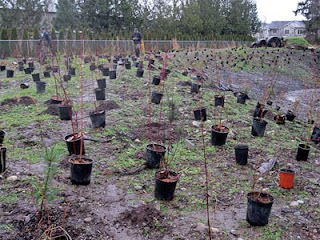 The final phase of the project involves planting thousands of native trees and shrubs in the riparian zones at both The Clearwater School and Clearwater Commons. 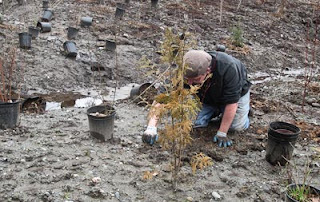 Scott Moore, Native Plant Steward at Snohomish County Surface Water Management, created a planting plan and plant list to re-vegetate the construction area. 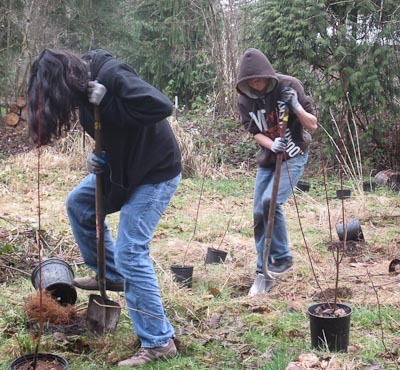 In the late fall, members of the Washington Conservation Corps (WCC) planted 1,000 trees on both sides of North Creek running through school property. 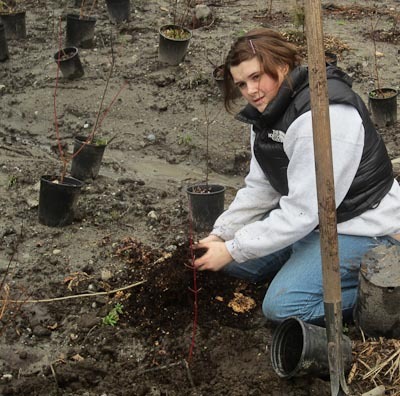 In early February, 3,000 shrubs were delivered and placed. WCC did much of the planting, and last week members of that crew trained Clearwater students and staff how to plant the remaining several hundred shrubs to ensure a high survival rate. 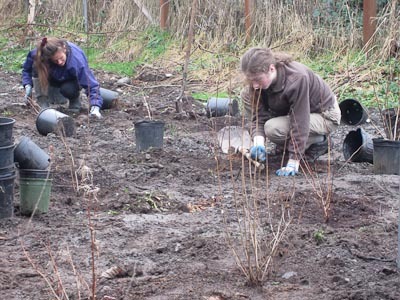 We have this week and next to finish the planting. 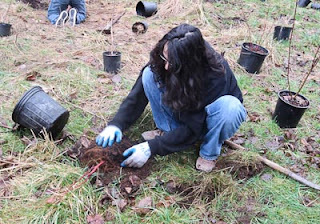 This week all four staff members and 10 students set aside time to get plants in the ground. As of this writing, staff member Mat Riggle is the undisputed planting efficiency champion. 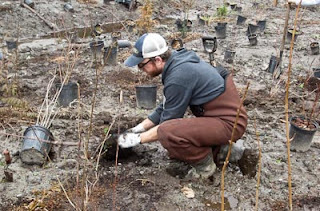 On Thursday he planted 36 shrubs in an hour--and stacked up a few rock cairns for decoration. Robert and Lucas were a close second and third at 28 and 26 plants in one hour, respectively. 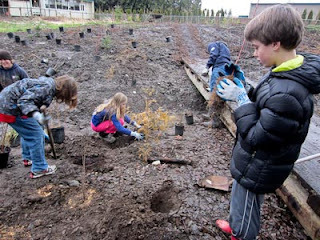 We love dreaming of and imagining how the landscape will look in 2, 5 and 10 years as the trees and shrubs grow and provide shade, habitat and beauty. 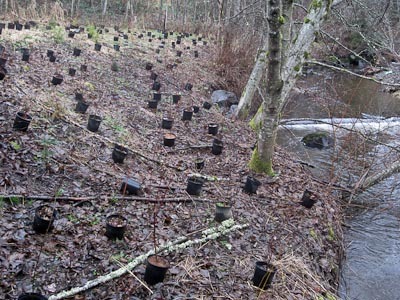 The stream-side land will become a forest. 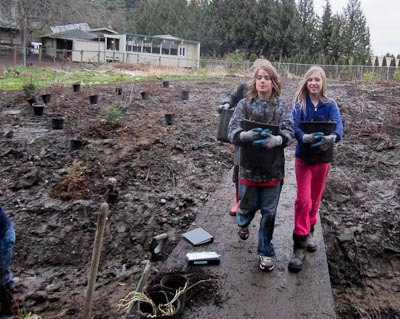 The restoration project is the result of a partnership between Snohomish County, Clearwater Commons and The Clearwater School, to enhance and protect natural habitat along a 1400-foot stretch of North Creek that flows through adjacent school and Clearwater Commons properties. Snohomish County received a grant for $75,000 from the National Fish and Wildlife Foundation to restore more natural stream flow and native wildlife habitat in the Clearwater Reach. 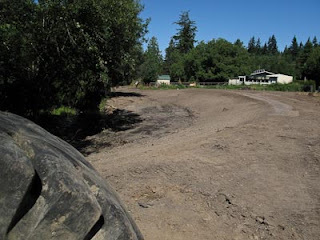 First, large machines removed tons of fill dirt covering the natural flood plain and removed or relocated large, stream-choking boulders that had been placed decades ago to minimize flooding. 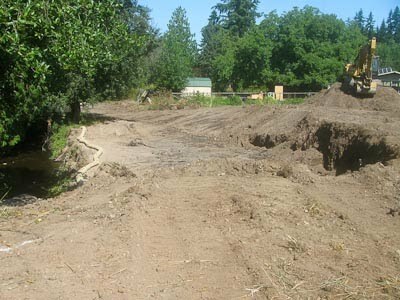 The heavy construction work, completed late last summer, installed quantities of large woody debris to slow the current and provide habitat. Now the creek can spread out during winter rainy periods and creek bed scouring should be reduced--allowing silt deposits to build up for salmon egg nests. 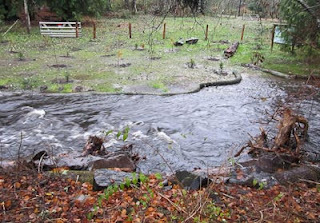 The Clearwater Reach of North Creek will not only be more hospitable for spawning salmon but other native wildlife, including stream invertebrates, amphibians, freshwater mussels and varied plant communities. 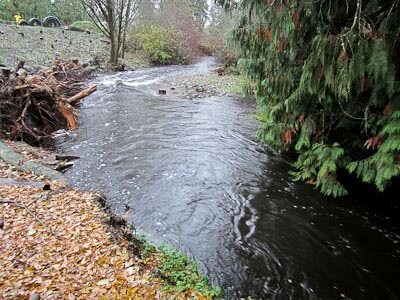 North Creek currently supports sockeye, Chinook and Coho salmon species. 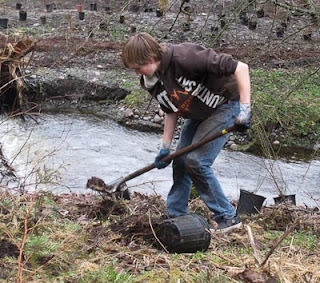 Our goal is to show that individuals, schools and government entities can work successfully together to create better wildlife and human habitat. 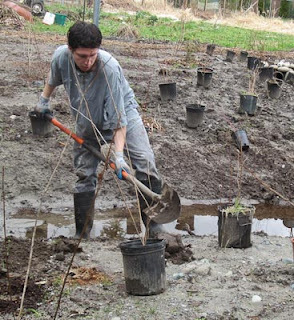 We hope our involvement in this effort will inspire future projects in other locations. 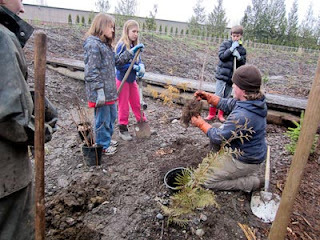 Next fall another round of planting will create ground-level density with herbaceous perennials such as ferns and salal. Trees planted last fall include Western red cedar, big leaf maple, beaked hazelnut, Douglas fir, cascara, vine maple, Sitka spruce, Sitka, Scouler and Pacific willow and bitter cherry. We are currently planting many of the following shrubs: Pacific ninebark, Indian plum, red elderberry, salmonberry, swamp rose, snowberry, Douglas spirea, Black twinberry, thimbleberry, serviceberry, red osier dogwood and stink currant.